A blog engine written in Go, compatible with Ghost themes. Create or update your posts from any place and any device. Simply point your browser to yourblog.url/admin/, log in, and start typing away! Use Ghost themes to design your blog. There's a great community of designers working on themes already. Check out the Ghost Marketplace to get an idea. You can also migrate your existing Ghost installation to Journey with a few simple steps. Write plugins in Lua to implement custom behavior when generating pages. Learn how to do it on the Wiki! Planning the future of Journey, support for MySQL, PostgreSQL, and Google App Engine are high priority goals. 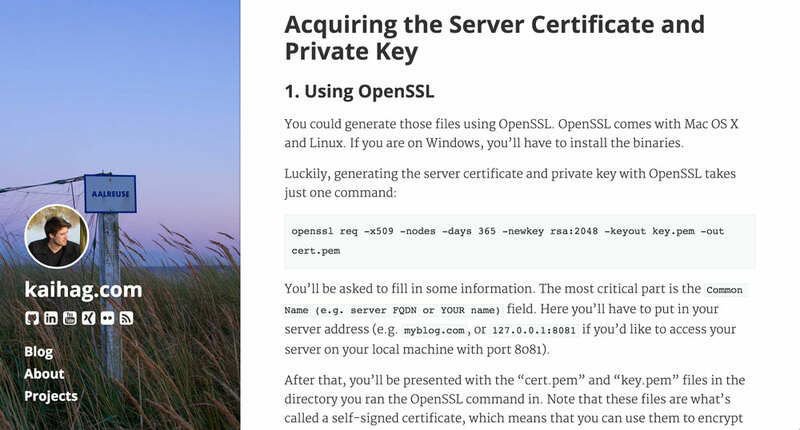 One click HTTPS via Let's Encrypt! 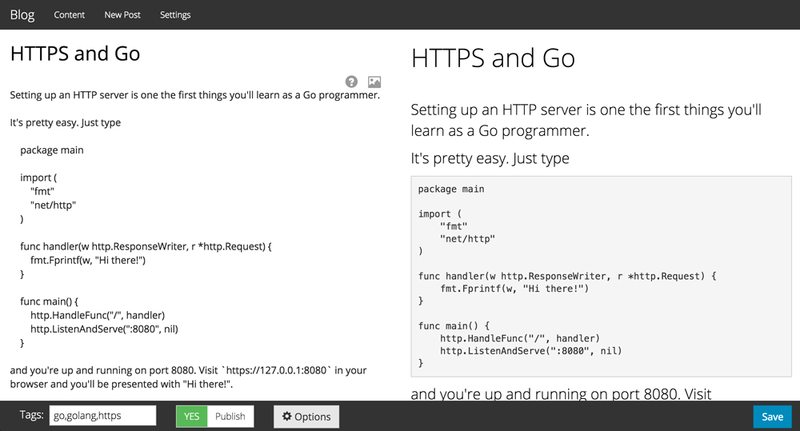 Other blog engines require you to install Nginx or Apache just to enable HTTPS. With Journey, simply enable HTTPS and Let's Encrypt support in the configuration and trusted HTTPS certificates will be automatically generated and renewed for you. Don't worry about installing the correct version of Node.js, Python, or anything else. Just download the latest release for your operating system and cpu architecture, then place the folder anywhere you like and run the Journey executable. Done! Journey eats very little of your precious memory. For example: Testing it on Mac OS X, it takes about 3.5 MB of it and then happily carries on doing its job. Journey is still in an early stage of development. However, initial tests indicate that it is much faster at generating pages than Ghost running on Node.js. Download the release package for Linux (AMD64, i386, ARM), Mac OS X (AMD64, i386), or Windows (AMD64, i386) and start using Journey right away. Build Journey from source to make it work on a multitude of other operating systems! Head over to the releases page and download the latest zip file corresponding to your operating system and cpu architecture. At the moment, Linux (AMD64, i386, ARM), Mac OS X (AMD64, i386), and Windows (AMD64, i386) packages are available. Others will follow. In the meantime, you can always compile from source. It's simple, really: Extract the downloaded zip file anywhere you like. You may rename the extracted folder to "journey" if you so desire. Just start the executable from your terminal or double-click it. in your browser to visit your Journey blog! By editing the "config.json" file in your Journey root directory you'll change all the important settings. and take a look at the admin interface. The Promenade theme comes with Journey to make it work out of the box, but it may very well not be your cup of tea. No problem! Just use another Ghost theme. Head over to the Ghost Marketplace to get an idea of what's out there. Finally, you can always write your own theme or edit an existiting one! Start by visiting http://themes.ghost.org and by reading one of the many tutorials that show you how to create a Ghost theme! If you're interested in plugins, start by reading the tutorial! For detailed instructions, please read the Setting up Journey Wiki page. For a practical example on how to set up a Journey blog on your linux server, refer to the Installing Journey on Ubuntu Server Wiki page! Journey is fully open source under the MIT license. Copyright © 2015 by kabukky. Based on Worthy.